I may have to get a larger vehicle. I pulled into Burney Lodging because I got a heads-up that some PCT hikers needed a ride. There were 5 hikers waiting for me. As we were figuring out if we could get all of the hikers and packs into the jeep, another red SUV pulled into the parking lot. Tara Goff had been on her way to the Dollar General with her daughter Destiny when they saw us all crowded around the little Jeep Liberty. Tara and Destiny also like to give rides to PCT hikers. They love to meet the hikers and hear the stories. Since they had already loaded their packs, four of them jumped into my vehicle and the fifth, a hiker from Raleigh, North Carolina, hoped in with the Goffs. We headed off to the park in a little caravan. In my vehicle I had a young lady from Alaska and Hawaii (in that order). Her name is Vortex. When I heard she was from Alaska and Hawaii, I said, “Oh! One of the Cool People who like to go to Cool Places!” She laughed. Also aboard was Kodachrome from Switzerland. He told me that there were a lot of Swiss hiking the trail this year. He was from the German speaking part of Switzerland. My final two passengers were Pornstar from Hawaii and High Roller from San Jose. It was a very vivacious group. Part of our conversation revolved around Dilly Dally. One of them had met Dilly Dally at Lost Creek just after she sprained her ankle. He thanked me for picking her up on top of Hat Creek Rim. Another asked if I had dropped her off at McDonald’s. He had met her at McDonald’s. I said “N0,” but that one of the first things she had asked us was where the McDonald’s was. They all knew Coppertone and Chipmunk. I told them about our gathering at the cache and Coppertone’s plan to set up again further north at McKenzie Pass and possibly some place in between. And so it went on our short ride to Burney Falls. They were all looking forward to going for a swim. We pulled in by the entrance, the Goffs pulled in behind us and I got a group picture. As you may have guessed, we are at the peak of PCT season in pit river country. Thousands of hikers who were delayed by the snow in the Sierras are now passing through. 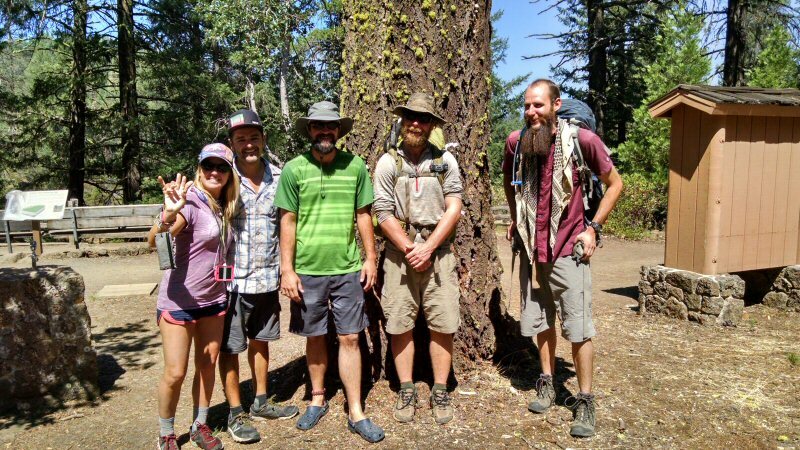 You may also have surmised that giving rides to PCT hikers is becoming popular. It is like the world is passing through the Burney Basin. Thank you for your posts in the Mt. Echo re the PCT people. You gave me courage to step out and help them when I see them. 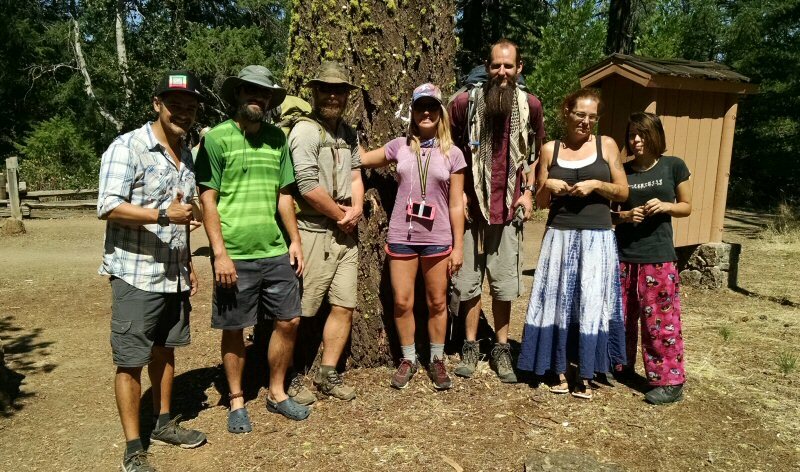 In the past week I have helped 13 get to their next trail location, or into Burney for supplies. It has been such a rewarding experience for me. The people are so alive and goodnatured. I love the interaction. Thanks for sharing about them and helping me feel safe picking them up. The first two warned me what to look for to assure I was getting a PCT person and not a hitchhiker. It might be something you want to address in your next column on them. They told me to make sure the person was NOT wearing jeans (don’t breathe and too hot for summer hiking)–to look at the backpack and look for walking poles, and to check out the shoes. Since I am female and have never before picked up hitchhikers, this was good info for me. Thanks to Diane for sharing and thanks also to Walt Caldwell, publisher of the Mountain Echo.